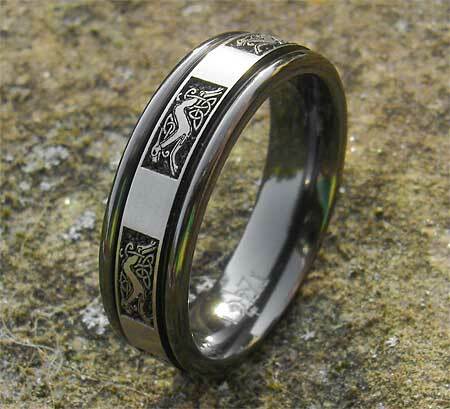 Men's Celtic Dog Ring : LOVE2HAVE in the UK! A men's unusual, flat profile, relieved black Celtic ring with edge rails and an engraved panelled Celtic dog design in a twin finish. The outer rails are in glossy black while the inner section is a matt natural grey zirconium colour as pictured. The width of this ring is 7mm, and an all-over polished version is available also in the same twin finish. 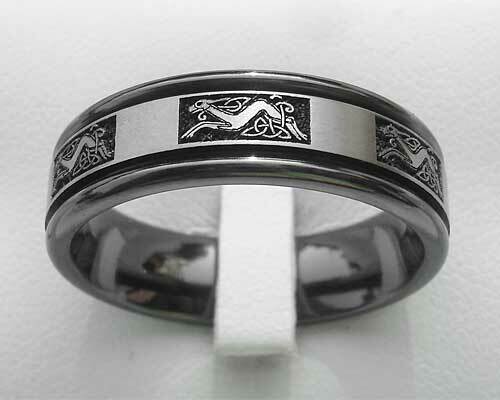 The detail in this engraving is stunning, with the black contrasting with the grey, making an excellent choice for men looking for a contemporary Celtic ring featuring man's best friend. The Celts commonly engraved animals. They came into contact with many different races such as the Vikings who influenced their art greatly. We think these designs make excellent engravings for our rings as animals are just as important to us these days, this ring is a good example featuring a dog.